I am not a morning person. I work best between the hours of midnight and five am. I can sleep through earthquakes, thunderstorms, and my iPhone’s “Marimba” alarm (and “By the Seaside” and “Illuminate” and Playtime”) no problem. If Guinness accepted entries in the category “most times half-consciously hitting the snooze button within a twelve-hour-period,” I would be a world record holder. If my husband, habitually an early riser, is feeling especially generous, he’ll leave a steaming cup of coffee by my side of the bed, so my nose can slowly rouse me from my rest. But sometimes he’s in a rush, or he’s away, or he doesn’t — for some other, completely inexplicable reason — have the time or desire to be my personal butler, and I have to drag myself to the kitchen to brew my own. It’s been years since the craze for all things artisanal made drip coffee makers scarce in the homes of soi-disant bon vivants. But who hauls themselves, booger-eyed and messy-haired, out of bed because they’re looking forward to weighing out the precise number of beans for a perfect pour-over? No one I know or would want to be friends with. But the person who grinds a batch of beans and fills a carafe with water and sets a handy timer the night before? Now there’s someone I recognize. Over at New York Magazine’s The Strategist, ten devoted coffee drinkers weighed in with recommendations for unfussy at-home machines. For a mere $30, you can snap up a classic, programmable 12-Cup Mr. Coffee, which features a “Delay Timer” so you don’t need a husband willing to pre-brew for you. If you find the classic a bit too déclassé, Cuisinart’s DGB-650BC 10-cup comes in brushed metal, can grind your beans for you, and will set you back a little under $100. If you have a large family, frequently host over-night guests, or simply have an unquenchable craving for caffeine (that’s me), Cuisinart’s 14-cup is listed on Amazon for just over $70. Remember, you’re just trying to get into the bathroom to brush your teeth — you can always head to a local coffee shop for something a little more sophisticated (or even brew a perfectly-made latte at home) once you have pants on. If your alarm isn’t always set to the same hour — or if you just like the idea of being able to tell a machine what to do first thing in the morning — there are smart coffee makers on the market, which will start brewing when your mattress senses you’re awake without you even pushing a button. 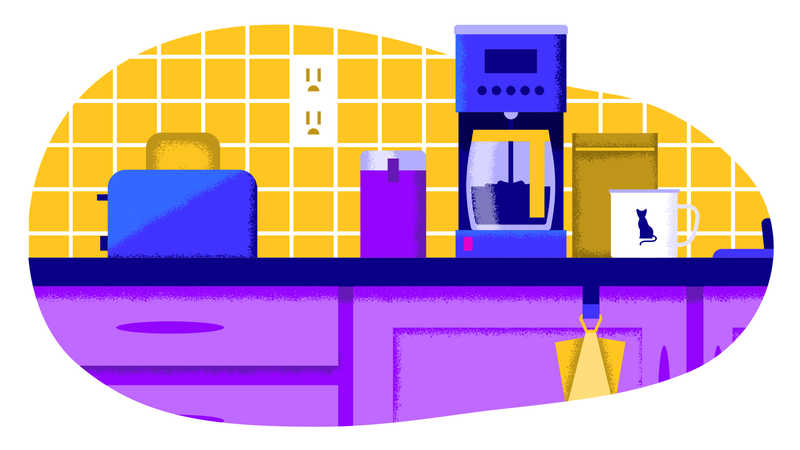 But as Gizmodo’s Kashmir Hill discovered when she tried to bring one into her life, having an effective smart coffee maker means considering a lot of different device capabilities (the maker needs to be able to speak to your mattress, for instance, or your Alexa, or both) which may be more than you want to think about before you’ve had that first cup. Either way, be careful: The occasional drinker will feel more energetic and productive after a single serving. But, like with alcohol and nicotine, the more caffeine you consume, the higher your tolerance — and the more you’ll find that even the sweet smell of fourteen cups of pre-brewed coffee isn’t enough to get you out of bed in the morning.